The stoppable force (Indians offense) takes on the movable object (Royals bullpen). What a time to be alive. The Royals get their first look at the three-time division champion Cleveland Indians this weekend as they welcome them in. The Indians off-season was puzzling to most as they seemed to be in cost-cutting mode, dangling both Corey Kluber and Trevor Bauer in trades and actually pulling the trigger on moving Edwin Encarnacion. Their outfield situation is a bit of a disaster, and their struggles have been magnified by Francisco Lindor’s injury that is keeping him out awhile and a long run of futility from Jose Ramirez, who was a real possibility to win the MVP as recently as mid-August last year. The bullpen, a surprising problem last year, has actually been pretty good. They don’t have the name recognition of years past outside of Brad Hand, but it’s a quality group. Of course, the injury to Mike Clevinger is a big one that they’ll feel, but with their starting pitching depth, it’s not a reason to panic just yet. Carlos Carrasco signed a somewhat puzzling extension this off-season to keep him in Cleveland through 2022 at least. After a four-year run where he threw 722 innings with a ton of strikeouts, very few walks and very few runs allowed, he signed for four years and $47 million. I still don’t get it. I know he’s 32 now, but that just seems very light. I guess if he’s comfortable, that’s what matters. This year has been a weird one for him. He’s had 16 strikeouts in 9.1 innings, but also allowed 16 hits, which has led to an inflated ERA. He’s allowed an average exit velocity of 95.4 MPH, which is crazy. He has great movement on his pitches, which leads to swings and misses, but he’s throwing the ball in the strike zone way more than in the past, so when hitters do make contact, it’s good contact. Against the Royals and their chasing ways, he can probably safely live outside the zone a bit more and get back on track. Keller has battled this year, which is nice, but back-to-back six inning, three run starts isn’t what the Royals need from their number one. And it’s probably not fair that he’s their number one, but here we are. Even with the mediocre outings, Keller has continued to keep the ball in the yard, which is always a good thing. His command has been off his last two times out, but luckily this isn’t an Indians offense that has many ways to make you pay. They will work some walks with guys like Santana, but he should be able to work around them. He made a couple starts against the Indians last season and was really pretty okay, going seven innings once and allowing three runs on 11 hits and five innings once while allowing two runs on six hits. This is Clevinger’s spot and the Indians have not yet named a starter for this game, so we’ll see! The Royals will counter with Homer Bailey who has been surprisingly weird. He’s struck out a ton of hitters and gotten the swings and misses you like to see. But the home run ball bit him big time in his start against the Mariners on Monday. In spite of the inflated ERA, I have to say that I’ve been surprised with him and while I don’t think he should stay in the rotation very long, I could actually see a spot in the bullpen for him with the Royals. He’s 3-4 with a 5.79 ERA over nine career starts against the Indians and gave up five runs on 10 hits over 5.1 innings last year in a start against them when he was with the Reds. Maybe Bailey can finally put some of these swings and misses together with success. 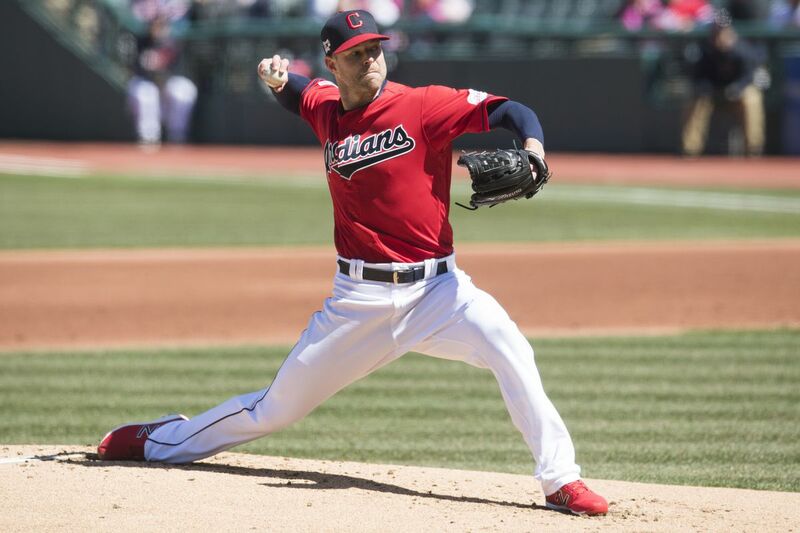 So the Indians have this guy named Corey Kluber and, as it turns out, he’s quite good. I remember writing these previews back in 2013 for Pine Tar Press and he was ready to face the Royals in early July and I saw this guy with a strikeout per inning, next to no walks, a good home run rate and an ERA over 4.00 and I kept thinking that he absolutely should be better. He went out and gave up four runs over 5.1 to the Royals with only three strikeouts, but since and including that game, he’s gone 89-47 with a 2.90 ERA and two Cy Young Awards. Even a broken clock is right twice a day, I guess. Anyway, he’s back at it this year, but he’s been strangely hittable in his first three starts, which has people worried that maybe he’s regressing. And at 33, that’s possible. His velocity is down a touch and his cutter hasn’t been as effective, so maybe he is taking a step back. Even so, I’m fully expecting a nice start from him in this one, though he has struggled at Kauffman Stadium in the past, so I guess you never know. I always find it funny when Jakob Junis is matched up against Kluber just because of all the talk that Junis could become Kluber, which was always sort of weird even though I really like Junis. Anyway, the numbers for Junis this year are not terribly pretty with the high ERA, but he’s striking out a ton of hitters with a K-rate of 28.2 percent. He’s not walking many more than usual and he seems to maybe be getting BABIPed to death. He’s not being hit any harder than in the past with a comparable exit velocity allowed and an even lower hard hit rate than in previous seasons. The big issue is that he’s throwing in the zone less and while chase rates on him are up, they’re not up enough to make up for it. I’m thinking he’s consciously throwing fewer strikes with the idea of giving up fewer home runs. My guess is things even out relatively soon for Junis if he keeps getting this many strikeouts and he’ll end up just fine in the end. The Indians keep winning in spite of an anemic offense and the Royals keep losing in spite of, well, they don’t really do that much well. But they do have some good players sprinkled on the roster, so in spite of that. I think the Royals do find a way to win a game, but that’s it and the woes continue as they hit the road. What say you? Royals vs. Clevelanders: Who Takes It? The Royals could upgrade with a right field platoon The Royals are not currently getting much out of their right fielders, but that could change soon. Ned Yost’s approval rating drops among Royals fans Boom, Yosted. Whose Royals debut did you anticipate the most? Welcome to the big leagues, rook. Royals Rumblings - News for April 25, 2019 Do more of that winning thing, Royals. The Yost with the Most (Losses) Should Royals fans expect more?